New Trend in Revealing Salary History -- Lead to Equity? Because of the wage disparity between genders, various U.S. communities have passed laws relating to the job interview process. These laws represent a new trend in revealing salary history during job search. Check out this post. What We Earn by Age, Gender, and Race. Then take a look at this infographic from the Women’s Bureau, United States Department of Labor. And here’s an link from the U.S. DOL. www.dol.gov/wb/EqualPay. Also, click here to see each state’s laws on pay transparency equal pay. As a result of the pay differences, for some U.S. locales, we are entering a new era with regard to salary information during the job search process. In particular, one trend involves forbidding employers from asking a candidate’s past salary history. Now, we look at the rationale for the new laws. And the locales that have already enacted such laws. 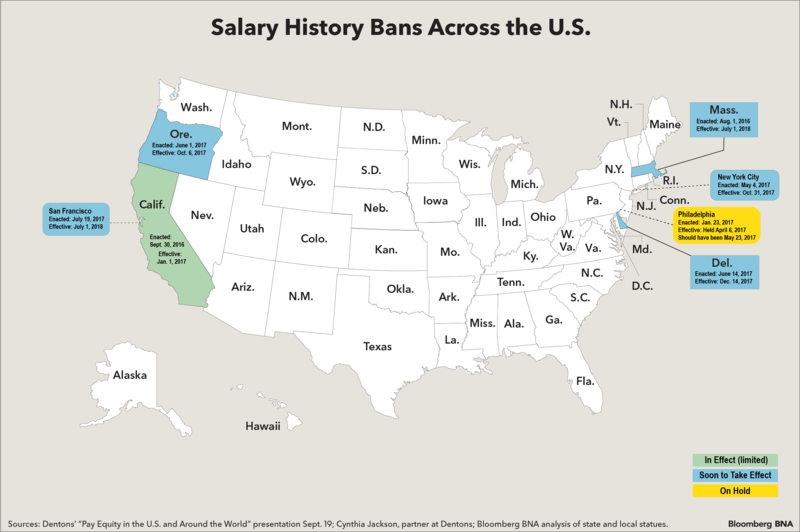 While the list of areas with salary history laws is growing, this September 2017 chart shows the early locales with such laws. Click the image for a larger version. And to see what status the laws mean in each locale.